Temple of Isis first pylon, Philae, north-eastern (back) view. Pylon is the Greek term (Greek: πυλών) for a monumental gateway of an Egyptian temple (Egyptian: bxn.t in the Manuel de Codage transliteration). It consists of two tapering towers, each surmounted by a cornice, joined by a less elevated section which enclosed the entrance between them. The entrance was generally about half the height of the towers. Contemporary paintings of pylons show them with long poles flying banners. In ancient Egyptian theology, the pylon mirrored the hieroglyph for 'horizon' or akhet, which was a depiction of two hills "between which the sun rose and set." Consequently, it played a critical role in the symbolic architecture of a cult building which was associated with the place of recreation and rebirth. Pylons were often decorated with scenes emphasizing a king's authority since it was the public face of a cult building. On the first pylon of the temple of Isis at Philae, the pharaoh is shown slaying his enemies while Isis, Horus and Hathor look on. 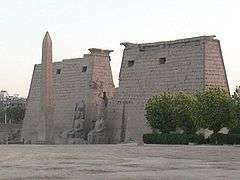 Other examples of pylons can be seen in Luxor and Edfu. Rituals to the god Amun who became identified with the sun god Ra were often carried out on the top of temple pylons. In addition to standard vertical grooves on the exterior face of a pylon wall which was designed to hold flag poles, some pylons also contained internal stairways and rooms. The oldest intact pylons belong to mortuary temples from the 13th and 12th century BCE Ramessside period. A pair of obelisks usually stood in front of a pylon. A single stone pillar standing at the Propylaea of the Acropolis in Athens is known as the pylon. Both Classical Revival and Egyptian Revival architecture employ the pylon form, with Boodle's gentleman's club in London being an example of the Classical style. 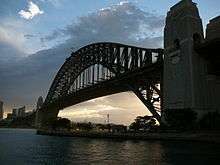 The 19th and 20th centuries saw pylon architecture employed for bridge building with the Sydney Harbour Bridge being one of the largest examples. In 1928 a Pylon was erected by public subscription to commemorate the extension of the County Borough of Brighton on 1 April of that same year. The two stone towers known locally as "the Pylons" (sic) still stand and are clearly visible to travellers on either carriageway of the A23. The Patcham Pylon towers flank the southbound carriageway of the A23 just outside the CIty of Brighton and Hove and are listed Grade II: of special interest warranting every effort to preserve them. 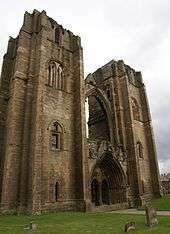 Many cathedrals have a similar western end, such as Elgin Cathedral. 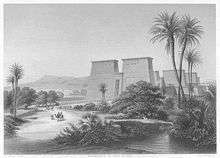 Entrance of the Temple of Luxor, western façade; a pair of obelisks usually stood in front of a pylon; the 2nd obelisk (the Luxor Obelisk, 23 metres (75 ft) high, not shown) had been moved to France.